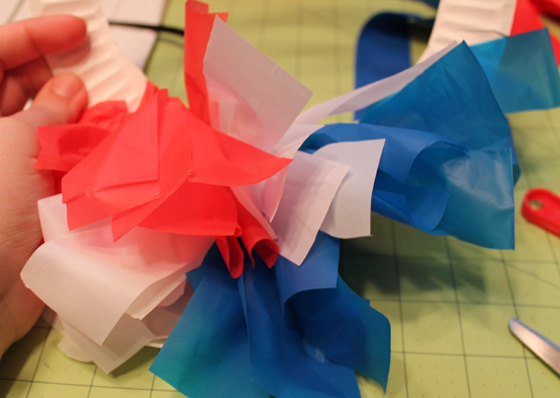 If you made our patriotic windsock project from yesterday, you’re going to have some plastic tablecloth strips leftover. Don’t want to toss them in the trash? 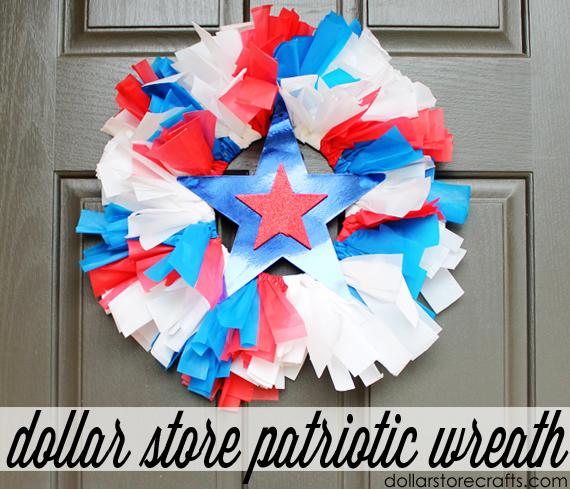 Use them to make this festive last minute wreath! 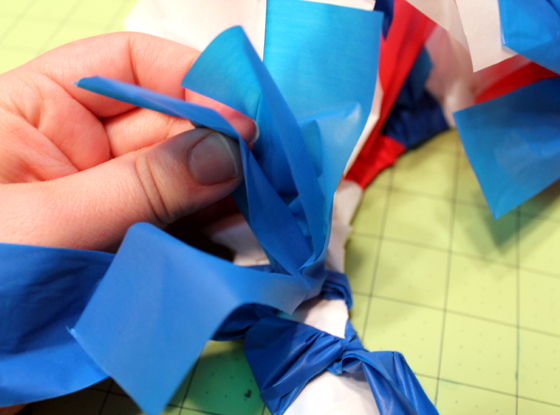 Even if you didn’t make the windsock, this wreath is a quick and easy project. Cut the tablecloths into long strips that are 1.5 inches wide. 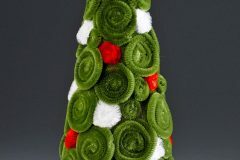 Step 2: Make the wreath. 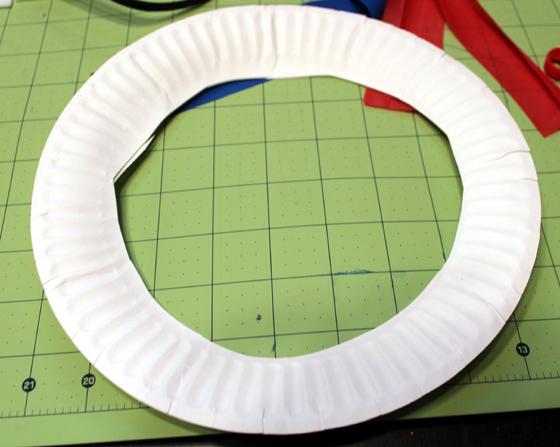 Cut a circle out of the middle of your paper plate. (Don’t worry. It doesn’t have to be perfect.) If your plate is thin, you may want to stack 2-3 plates together. 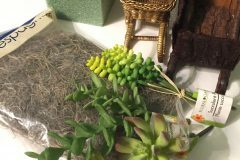 Take one of your tablecloth strips and fold it into a shorter strip that is about 8 inches long and trim the ends through the loops so that you have a small bundle of 8 inch plastic strips. 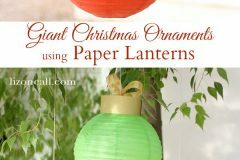 Tie the bundle around the paper plate and then pull the pieces apart to fluff them. 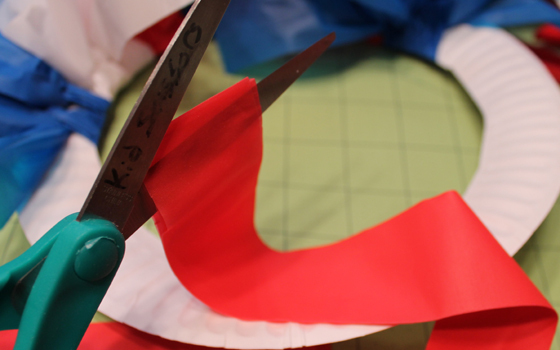 Continue tying small bundles of strips around the plate, alternating colors between red, white and blue. To make the colors stand out more, I tied two bundles of each color at a time. Step 3: Make the center. 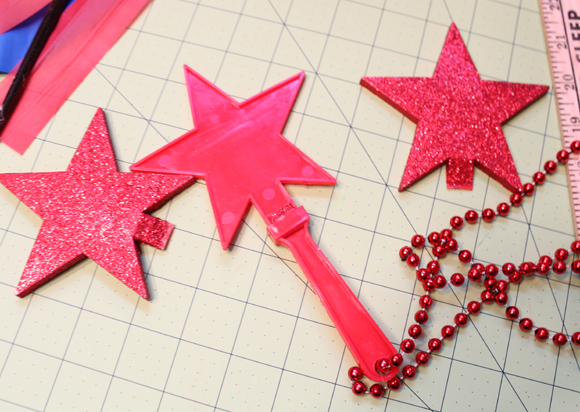 Cut the stars off of the noisemaker. Cut the tab off the bottom as well. 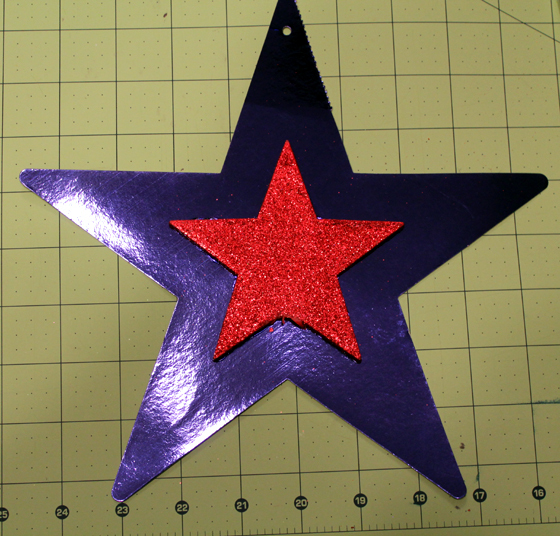 Center a red star from the noise maker in the middle of your metallic star cut out (these came in packs of 5 at my local dollar store) and attach with hot glue. 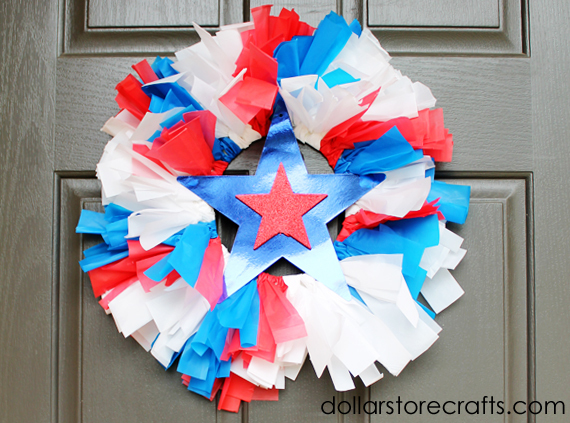 Use hot glue to attach the points of the star to the wreath before hanging on your door! This is such a cool idea, and such a fun possibility is to be had for other themes and this basic design! 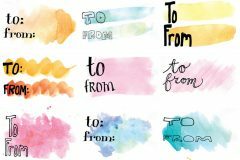 Thanks so much for this, and I’m sharing this on my blog! 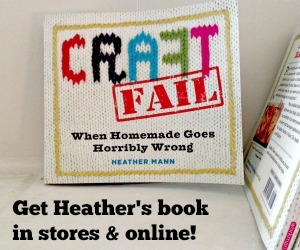 I liked your fun and patriotic ideas so much I shared them on my blog today in my post about what’s going on in my craft studio…here: http://mamapicturethis.blogspot.com. What a festive way to get ready for the 4th!